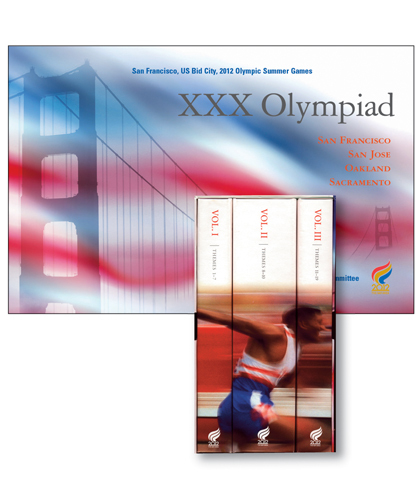 The mission of the Bay Area Sports Organizing Committee (BASOC) was to be selected by the United States Olympic Committee (USOC) as the US candidate to host the 2012 Olympic Summer Games. The Bay Area (San Francisco, Oakland, San Jose and Sacramento) competed against seven other US cities. in-house resources, BASOC consulted a wide variety of experts from architects and transportation analysts to sport authorities and local civic groups. Their volunteer contributions had to be organized, edited and coalesced into a single functional and inviting document. Led by Lindon Leader, a small fully dedicated design team of production artists and IT specialists directed a network of consultants and writers throughout the Bay Area to efficiently produce the document’s 675 pages. In December 2000, BASOC submitted to the USOC a highly detailed document evidencing competency in all aspects of Olympic Games management, including venue design, transportation, housing, weather and security. The design project was completed on time and on budget.